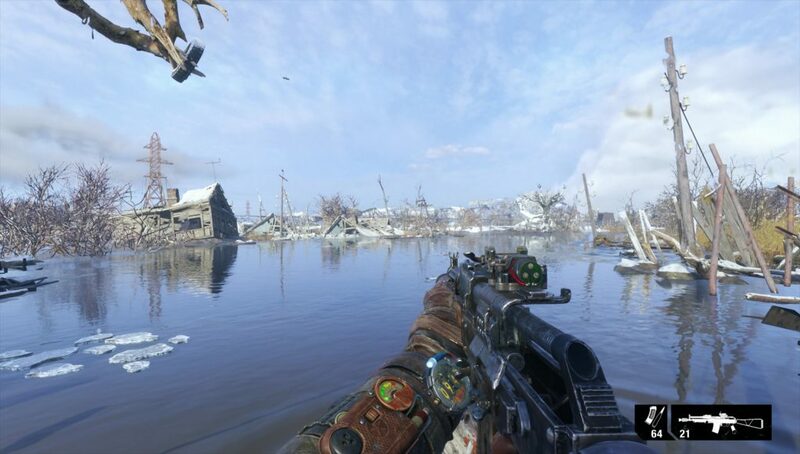 Artyom’s suit upgrades are items in Metro Exodus. These gear upgrades can increase your ammo capacity, damage resistance, or even give you new abilities. They’re not vital, but they can make your life easier, especially if you’re playing on a higher difficulty setting. When you find them all, you’ll get the Dressed for Success achievement. If you’re wondering exactly where these gear pieces are hidden, our Metro Exodus Artyom’s suit upgrade locations guide will show you. A lot of these upgrades can be found on the Volga map, which is the biggest of the early areas. 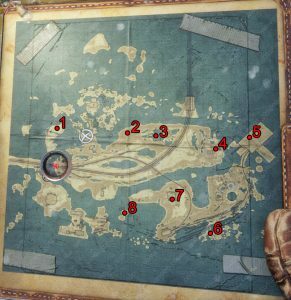 We’ve found eight of them there, mostly hidden around places that aren’t visited as part of the main story mission. Some of them are locked behind elaborate puzzles, while others are just waiting to be picked up. Where to find gear & suit upgrades in Volga chapter? There’s a compass upgrade (1) in the plane wreckage in the northwest of the map. The plane is at the end of the big peninsula in the west. You can enter it using the hole in the side. Head into the cockpit, and you’ll find the upgrade on the floor between the seats. If you go to the north side of the big central island, you’ll find a lone shack in the middle of the wasteland. Inside, there are a couple of desks. There’s a dead body next to one of them, and a crate full of junk on the other. If you inspect the junk, you’ll find a gas mask filter upgrade (2) there. If you continue to the east, you’ll soon reach a red brick building by a pond. It’s a bandit fortress, which you’ll recognize by the white skull painted on the wall. As soon as you enter, turn right and you’ll see an ammo pouch (3) on the crate. Go to the far east of the main island, and you’ll into a gas station. There’s a bandit camp here as well, so be careful. If you go into the back, you’ll find a throwing weapon harness (4) on one of the shelves. It’ll allow you to carry more grenades, molotovs and such. Cross the water to the east, and you’ll end up at the main terminal building. You can find a pair of night vision goggles (5) inside, which will let you see in the dark. They’re behind a locked door, though, and getting it to open is no easy feat. If you want to get to the other side of that sturdy oak door, check out our guide on how to get night vision goggles. Follow the tracks south of the terminal to the south side of the island. Go to the small peninsula in the south, past the train wagon graveyard. Look for a derelict shack in the western part of the peninsula, east of the big silo. Go inside and you’ll find a metal detector (6) on a desk, surrounded by a bunch of clocks. If you follow the tracks north towards the main island, you’ll run into a bandit camp in the old, ruined building. Enter the ruins from the south and go into the first room on the right. You’ll find the helmet reinforcement on an improvised table next to the bonfire. finally, there’s a battery charge controller on the small island south of the main one. You’ll need a boat to get there, and you’ll need to solve a complicated puzzle by turning knobs, pulling levers and pressing buttons. If you want to know how to solve it, check out our guide on how to get battery charge controller.